The Real Time Farms Headquarters had a plump acorn squash from Brines Farm (hurray for cold storage for extending what’s in season!) lying around, just begging to become something delicious. As I mentioned recently, I’m quite enamored with Yotam Ottolenghi’s cookbook Plenty, and as soon as I saw that squash, I knew just what I wanted to cook. Ottolenghi’s “Crusted Pumpkin Wedges with Soured Cream” with the squash used in place of pumpkin. And then I prepped the crust ingredients: fresh parsley and thyme, lemon zest, Parmesan cheese, panko (Japanese bread crumbs), and salt and pepper. 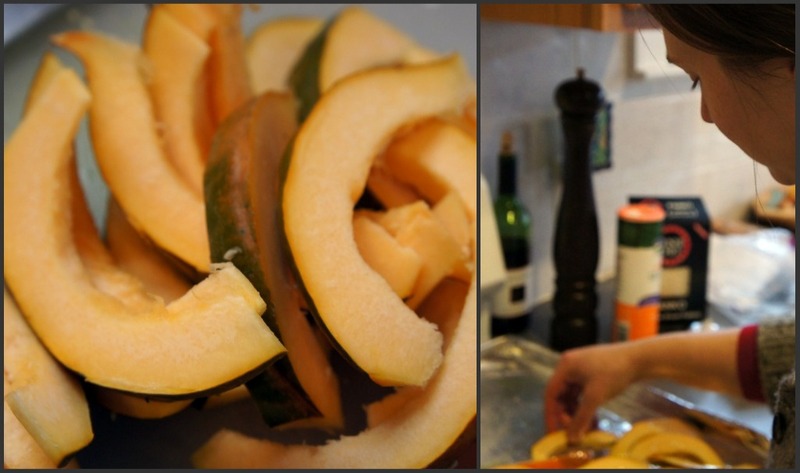 The crust mixture gets evenly spread out across the squash slices, and lightly patted down (so it sticks to the oil) and then the squash is baked until it is soft and the crust is golden and toasty. The crusted wedges are served with sour cream mixed with freshly topped dill. The wedges were tasty – the soft squash paired with the stuffing-esque crust and a dollop of sour cream reminded me of Thanksgiving, and made for a nice winter lunch. Unfortunately I couldn’t find this recipe legally reprinted online, so you might have to pick up the book, or just wing it! This entry was posted in In the Kitchen (recipes & more) and tagged acorn squash, brines farm, cooking, lindsay jean hard, locally grown, Real Time Farms, recipe. Bookmark the permalink.